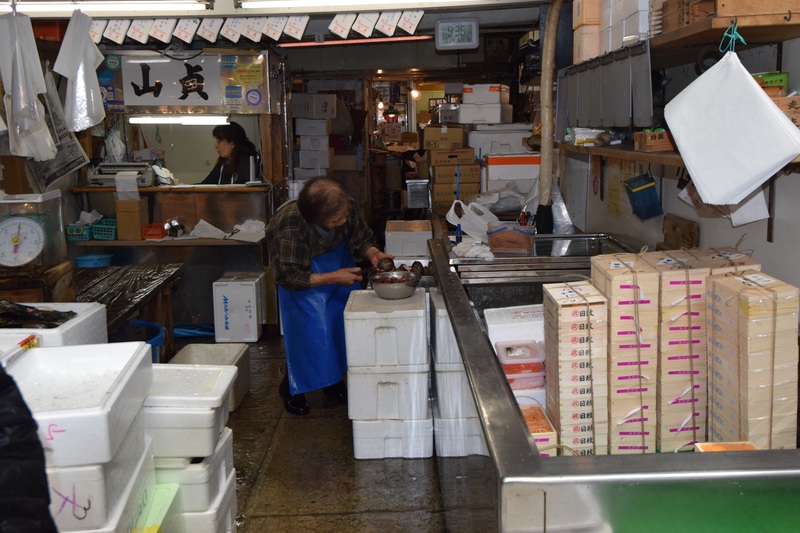 There is no other way to describe Tsukiji, the giant Tokyo fish markets. 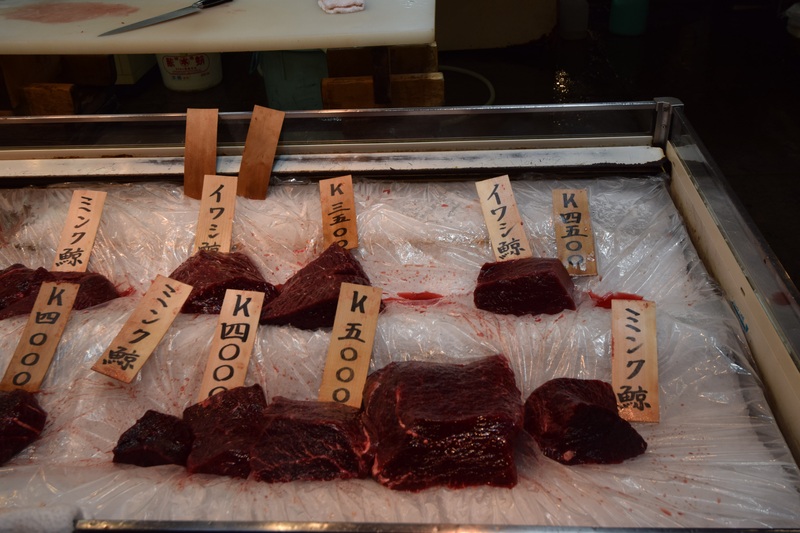 Although the market itself opens at 4am, they only let the gawpers like us in at 9… Apart from a tiny band of tourist keen enough to be there queuing when they open for the 120 observer passes to the tuna auction. We were not that keen. So Rob and Jenna, Peter and I, set out at a more civil hour for “just a look”. Wow! A vast terrain of polystyrene, water, people and fish… teeming with custom vehicles suited to transporting wares down narrow aisles, some more river than road; all admist a growing throng of incredulous foreigners – gaijin – in inappropriate footwear, cameras clicking, at times oblivious to the hazards all around. Not just the vehicles, but men walking along swinging their meat hooks (well, I suppose you’d call them fish hooks here), but think what you’d see in an abbatoir, not on a fishing line. 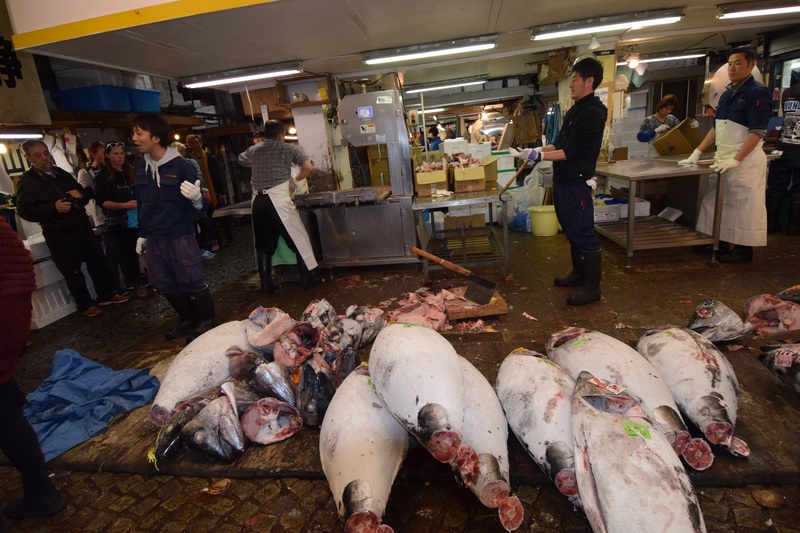 Officials trying valiantly to move the crowd along at the stall where the butchering of large tuna carcasses was going on – by axe and bandsaw. 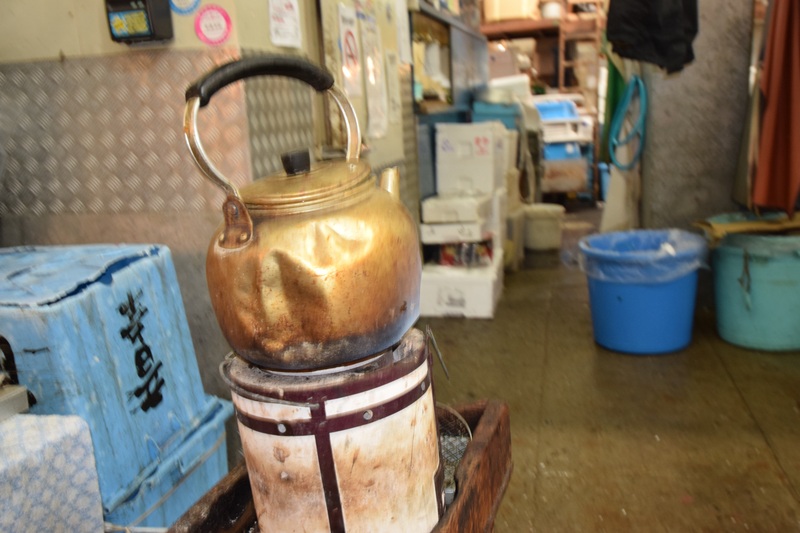 All juxtaposed with scenes from another world – the old copper kettle steaming away gently, and the bent over old lady shucking oysters out the back. 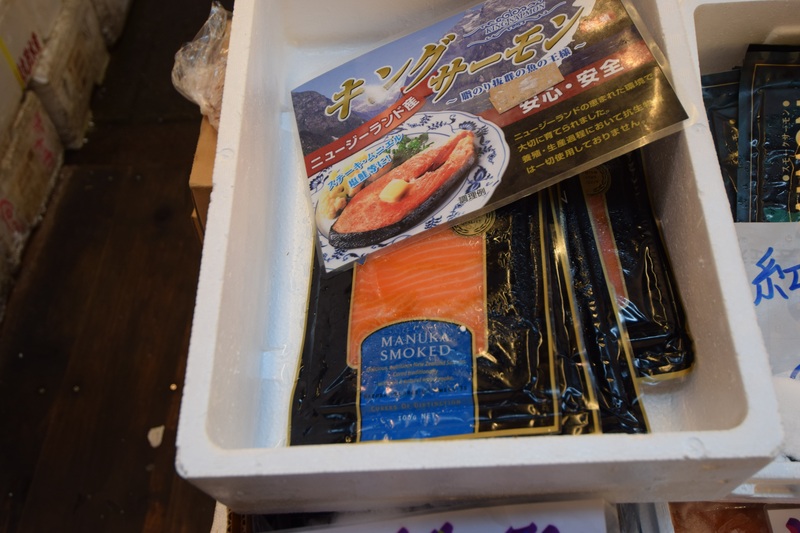 And looking incredibly out of place… New Zealand salmon, Manuka smoked, if you want a more packaged option! We all did a lap together, the four of us, and then Rob and I went back for more – the fascination of so much industry, so much freshness, the blood and water flowing together, the urgency with which everything is done, the fish, the people… all overcoming the sensory assault of sights, sounds, smells and slipperiness; and yes even the feeling of horror at seeing in the fles, literally, what I knew could only be whale meat. By 10 we were done, and ready to find the freshest sushi in town for Rob and Peter. A small queue at a nearby stall, and they were in for what they described as the best ever “happy to come back tonight and do it all again” food experience. I was vaguely tempted, until Rob pronounced that his favourite was the sea urchin. Yeah, maybe not. From there we followed my very poor directions to our planned lunch stop – for what Peter remembered as the best spare ribs ever. A 4.4km walk turned out to be much longer, through a combination of deliberate detours and really bad route planning. 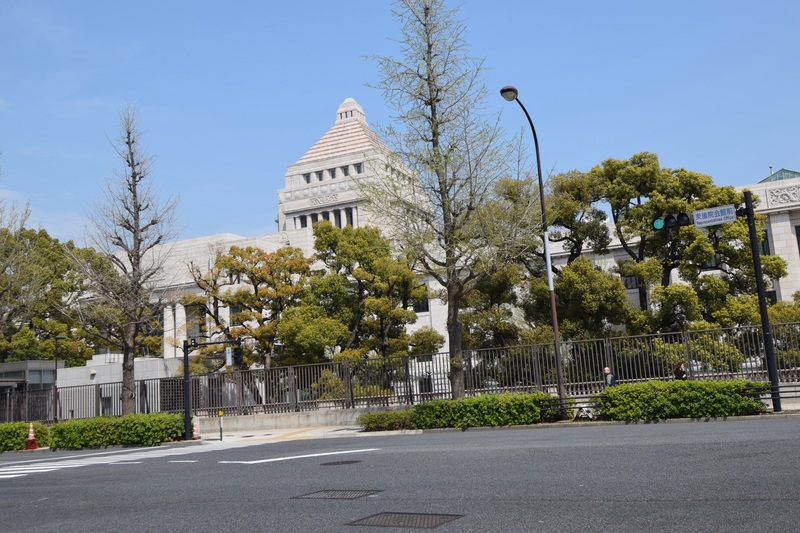 It was a great walk – through the very posh Ginza area (where we couldn’t resist a small black marble addition to our dragon collection) and then on through the “government” district, pristine and heavily guarded. 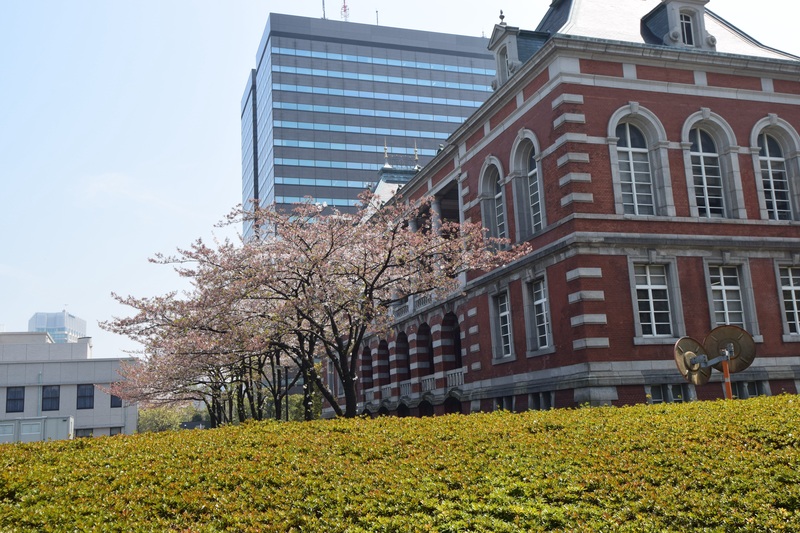 Orderly, orderly, orderly… That is Japan, and nowhere more so than in the parliamentary precinct. Two hours later, we plopped our parched selves down at the Rose & Crown, spotted in the distance by Rob – “surely must be a pub”, we thought. And yes it was, with good beer, and a helpful waitress who informed us that our chosen destination was just a 5 minute walk up the road – and came out onto the pavement with us to check we were taking the RIGHT road. As is so often the case, the ribs were not quite as great in reality as in recollection, but it was a good lunch. The taxi home seemed like a sensible choice too (though it did take us a wee while to figure out where our house was in relation to where he dropped us. Lesson of the day – follow Rob, not Peter’s Garmin (which admittedly is operating blind without a set of Japanese maps). Pretty much like the rest of us, really. 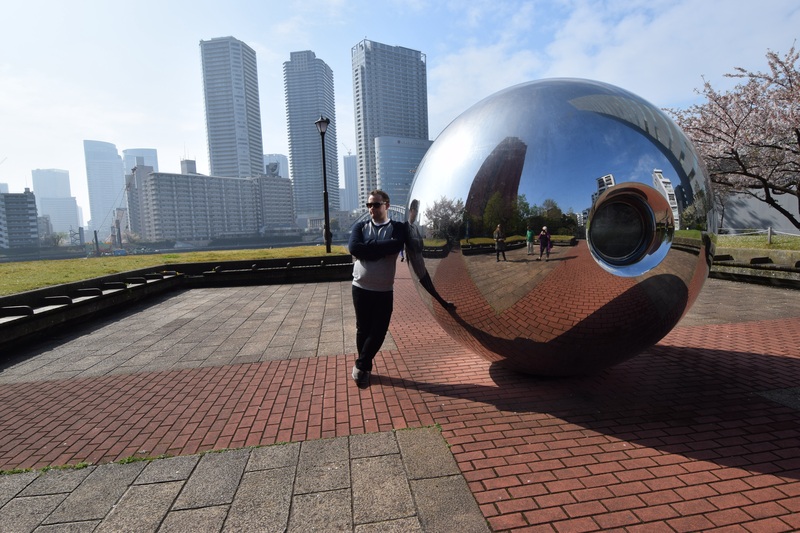 Time for a lie down – we walked 15km apparently – and even a nap for some; only to be woken by the excitement of the Gilbert family back from their trip to the Science and Innovation Museum, which sounds like the best trip ever for kids, and big kids too! Not sure who was more excited – the adults or the kids. And then, because we obviously hadn’t had enough exercise for the day, The girls set off on a shopping excursion, abandoning the boys with the tired children. The strong NZ dollar is making this a very attractive place to shop, despite the obvious limitations in catering for those of western size. Add to that the alarming return of winter temperatures – tomorrow the high will be 7C! – and a bit of shopping becomes a “necessity” rather than an indulgence. Along with the bad weather came the news – sensible but disappointing – that our great cycle tour has been cancelled. Can’t wait to see what Howard has in store for us in its place. 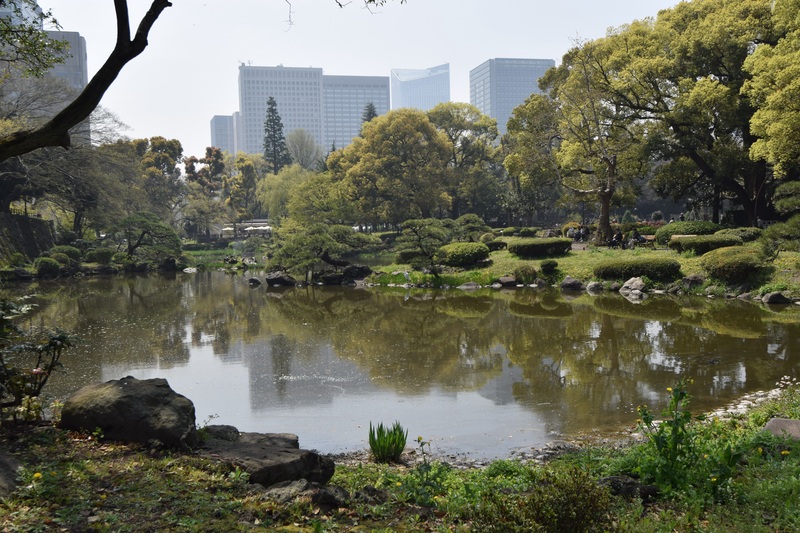 So much to see (and hear and do and taste and feel), so little time! i think the thing I love most is this. 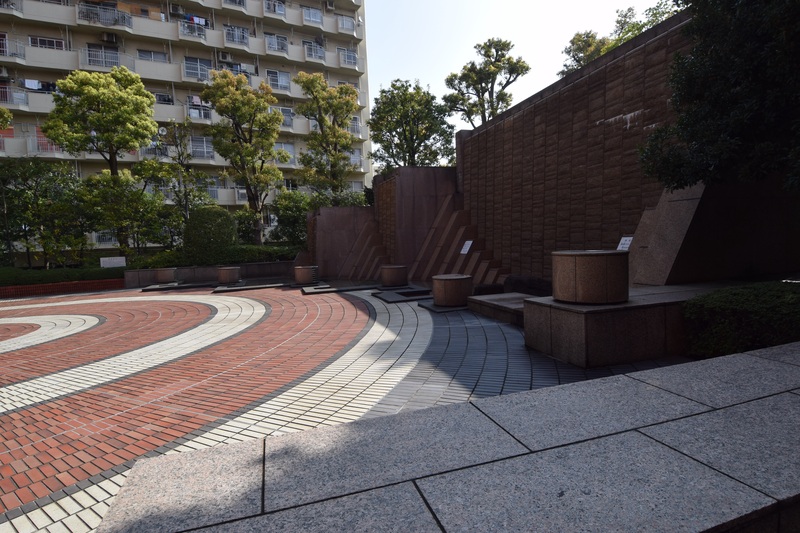 No matter how busy, challenging or confronting the experience, it seems there is always a quite place of tranquility just around the corniness. Very Zen! and taste and feel), so little time. ← Just like camping, only with walls and technologically advanced plumbing!